At its most basic, a brewery or distillery is a house of transformation. Grain, fruit and spices mix, break down, and reconstitute into beer, bourbon or gin. Store the product in a particular type of vessel – say, a whiskey barrel – and its characteristics change yet again. Craft alcoholic beverages are a growing business in Illinois, where some 83 craft breweries and 18 craft distilleries operate. Before these inventive beers and spirits became a reality, the brewery and distillery owners had to undergo a transformation of their own. For some, it meant a career change; for others, the fruition of a long-held dream. How these establishments came into being is almost as impressive as their products. The story of Copper Fiddle Distillery, 532 W. IL Route 22 in Lake Zurich, cannot be told without generous use of the word “serendipity.” For owners Fred Robinson and Jose Hernandez, everything about their bold adventure of becoming one of the first distilleries in Illinois – from the building to the bottle – seemed ordained by fate. One summer day in 2012, Hernandez, an architect, approached his neighbor Robinson, a golf professional, and asked if he wanted to go in together on a still. Robinson agreed. After a few vodka recipes ended in disaster, the duo hit on a tasty bourbon recipe. Taste tests confirmed they were onto something special. That’s when things got interesting. But before they could start selling their special blends of Bourbon Whiskey, Fiddle Gin and Tom Gin, the pair needed labels, bottles and a building. Again, fate stepped in. One day, Hernandez was talking with the owner of a car repair shop, lamenting about his hassles finding a distillery location. The owner tossed Hernandez the keys to his storage facility next door. An inspection verified it had high ceilings, good drainage and good water. Located on Route 22 near the intersection with Route 12 in Lake Zurich’s central business district, it was an ideal location for their retail-forward business. It was a perfect fit. When they chose a bottle, the bottling company told them they were the only producer in North America using that unique bottle shape. When they needed a unique label to fit the bottle, it turned out Hernandez’s daughter was dating a superb graphic artist, who offered to design it. Serendipity, indeed. But all the luck in the universe would not lead to success if the bourbon and gin weren’t good. It was customer reaction that transformed a budding Copper Fiddle into a profitable business which, Hernandez says, has been in the black since its opening day. All Copper Fiddle products are handmade, grain to bottle, on location. Hernandez says 70 percent of their bourbon whiskey and gin is sold retail on site, while another 30 percent is distributed through wholesalers. Hernandez and Robinson, both of whom still retain their full-time jobs, say their business model is working out better than planned, just like everything else related to their distillery. What started as a whim has turned into a reality. After 30 years entertaining a brewing dream, Curt Ames finally turned in his military uniform and launched a microbrewery. The retired colonel in the U.S. Marine Corps had been kicking around the idea of a microbrewery in the suburbs for years. In 2009, he registered the Chain O’ Lakes Brewery name, but the timing wasn’t right for starting a business, he says. Instead, he took a job at Northrup Grumman in California. The detour proved beneficial. “I found some good beermaking equipment out there in California and shipped it back,” he says. Eventually, the calling became too loud to ignore. Though he had the name and the equipment, he still needed a building. In 2013, Ames entered the bidding process for the old McHenry Brewery building in downtown McHenry. The Ameses poured themselves into the building’s rehab, transforming it into a working brewery. On Aug. 24, 2013, Chain O’ Lakes Brewery, 3425 Pearl St., was open for business. “The town loves that the building is a brewery again, and they’ve been very supportive,” says Ames. Chain O’ Lakes features a taproom and beer garden where patrons can enjoy one of the brewery’s mainstays such as Fox River Scotch Ale, The Colonel’s IPA or The Colonel’s WIPA, or a seasonal beer like Thunderstorm Black or I’m Bock. Once customers find one they like, they can take it home in a refillable growler or grumbler. Ames says he’s working on plans for distribution, but for now the best way to enjoy his product is to grab a pint at the brewery, where there’s a growing sense of community. Like Ames, Andy Burns is a retired Marine with a taste for craft beers. Upon graduation from Marquette University, he took a commission as an officer and served 4.5 years. His love of brewing began in college while working as a carpenter’s assistant. Though Burns’ deployment schedule put his hobby on hold, the idea continued to brew. 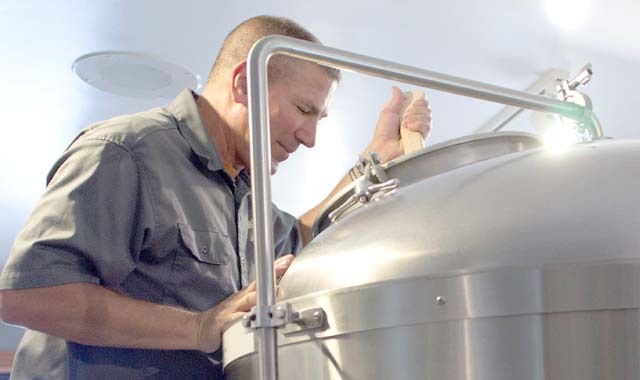 “By the time I left the Marine Corps, in 1996, I had a business plan in hand, had attended a handful of ‘how to start your brewery’ courses, and had met with a number of small-brewery owners to seek their advice,” he says. He took a different path than many craft brewers, as he transitioned from military man to beer connoisseur. Burns, with his brother Matthew and father Timothy, founded Emmett’s, 128 W. Main St. in West Dundee, with the goal of being both a brewery and a restaurant. Diners can enjoy great food along with one of Emmett’s signature handcrafted beers, like Munich Light, 1 A.M. Ale, Pale Ale or Red Ale. The company has since expanded into Palatine and Downers Grove. Emmett’s beers are also available at several regional restaurants and at more than 250 retail outlets. Burns says he’s proud to play a part in transforming Chicago’s craft beer scene. Business partners Eric Hobbs and Tom Korder each spent a decade learning at some of the largest brewers in the world. A Geneva native, Hobbs has worked for Miller-Coors, Anheuser-Busch InBev and Goose Island. Korder, a mechanical engineer from Urbana, worked at Anheuser-Busch for several years and learned to brew in the company’s pilot brewery. He was working at Chicago’s Goose Island, serving as the innovation and barrel program manager, before he and Hobbs decided to launch Penrose Brewing Co., 509 Stevens St. in Geneva. Penrose opened its doors this past March. Penrose emphasizes what its owners call The Requisites – Proto Gradus, P-2, Navette and Devoir – which are all Belgian-style ales that are lower in alcohol by volume. The menu also includes an extensive list of limited-release craft beers, because, as Hobbs points out, Korder is a prolific brewmaster. “Tom brewed nearly 50 recipes in the first four months we were open,” says Hobbs. Penrose products are on draft at several suburban bars and restaurants, while two of its beers – Proto Gradus and P-2 – are available in 12-ounce four-packs at various retailers. Whether resurrecting a gin lost in Prohibition or creating a craft brew unlike anything the big names produce, local independent distillers and brewers have transformed their lives and livelihoods to tantalize tastebuds and please palates. They’re fulfilling their dreams and creating loyal customers one drink at a time. That’s something worth tipping a glass to. This entry was posted on Tuesday, September 30th, 2014 at 11:58 am	and is filed under Features, Top Posts. You can follow any responses to this entry through the RSS 2.0 feed. Both comments and pings are currently closed.